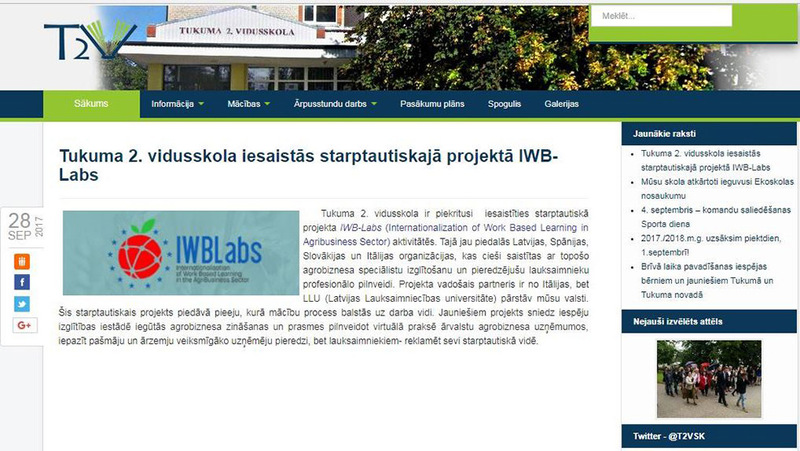 The IWB-Labs project partnership made contacts with web sites focusing on the fields of VET (Vocational Educational and Training). 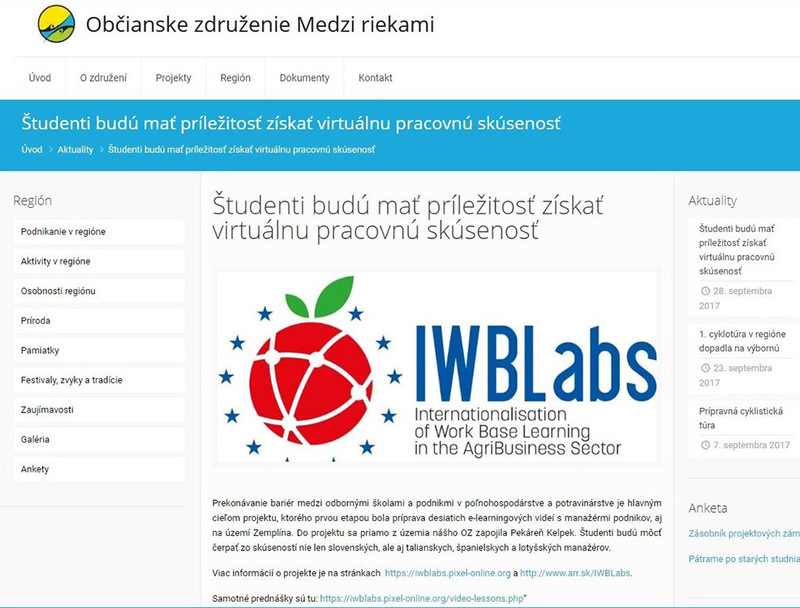 The IWB-Labs project was presented to the web masters and a link to the IWB-Labs project portal was made so that those who will access the selected web sites can also access, through a direct link, the IWB-Labs portal. Jelgavas Spīdolas ģimnāzija is VET institution in IWBLabs project. 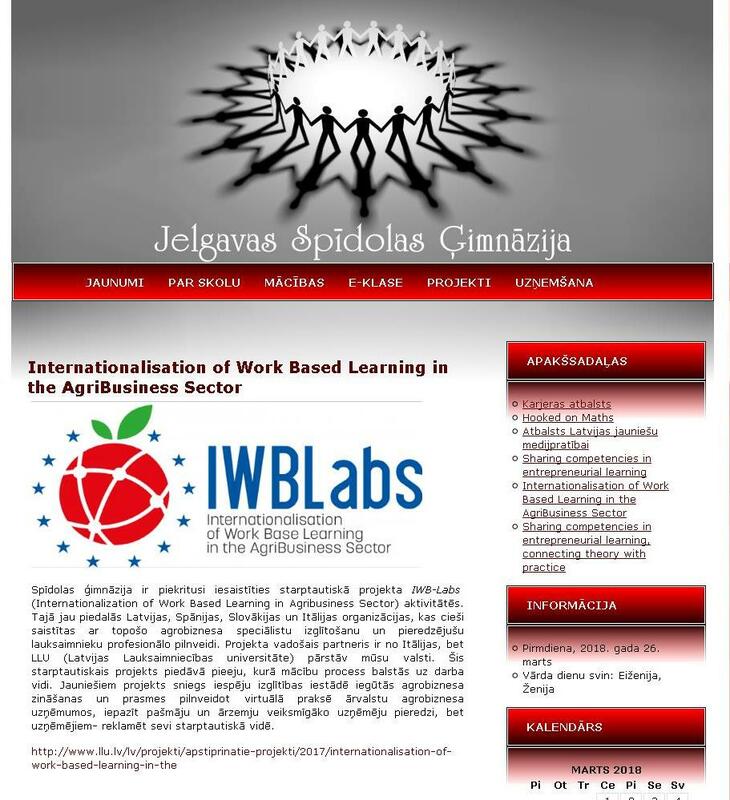 The information about the IWBLabs project is available on the webpage of the school. 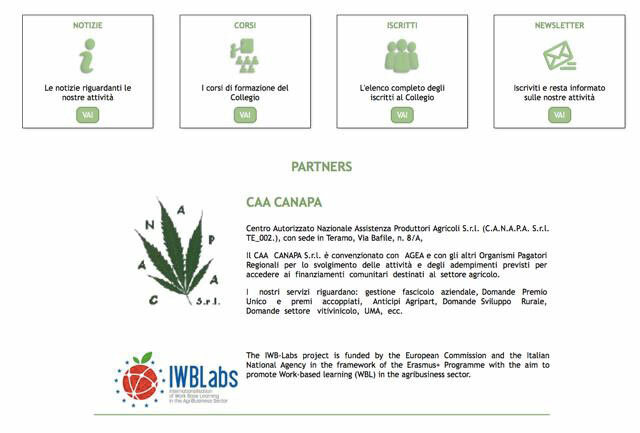 LAG Maiella verde is partner in the IWBLabs project. Maiella verde website provides information about the project together with a direct link to the Portal. 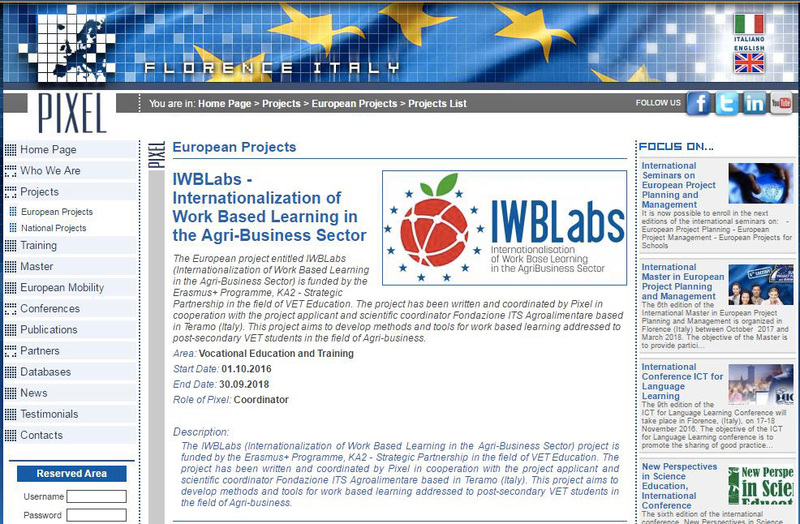 There are many users of Maiella Verde’s website that may now learn about and benefit from theIWBLabs project. 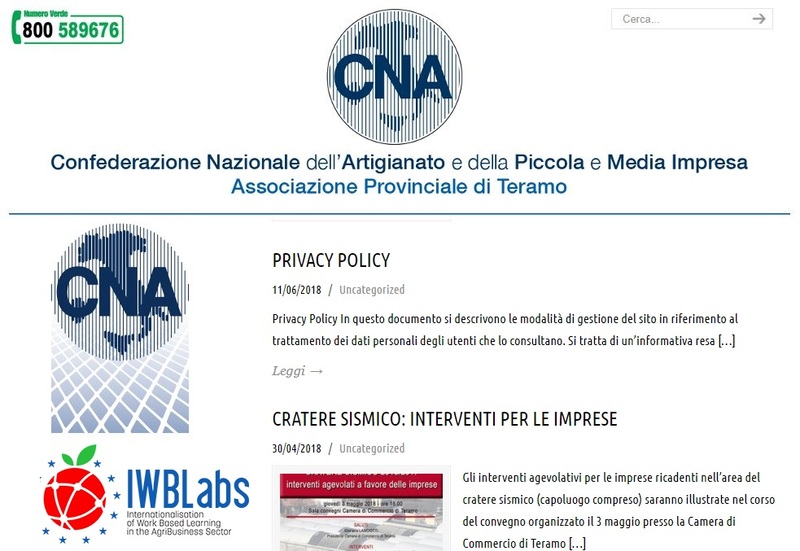 CNA Teramo is partner in the IWBLabs project. CNA website provides information about the project together with a direct link to the Portal. Studio Nardinocchi is involved in the IWBLabs project as a trade association. Studio Nardinocchi website provides information on the project along with a direct link to the portal. 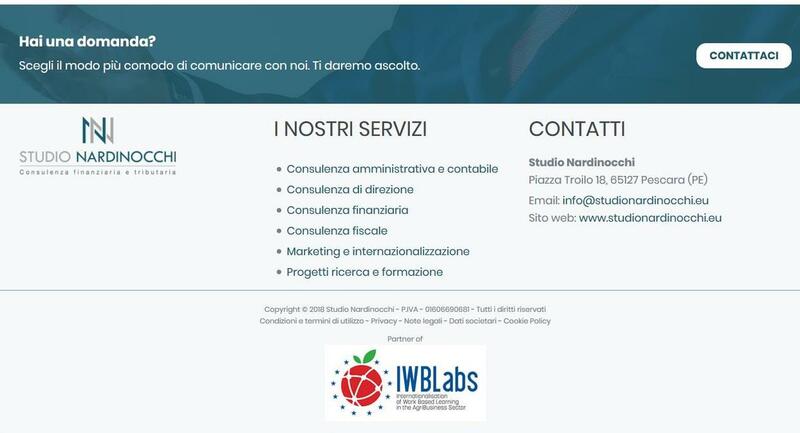 There are many users of Studio Nardinocchi website that can now get to know and take advantage of the IWBLabs project. Pixel is partner in the IWBLabs project. Pixel website provides information about the project together with a direct link to the Portal. There are many users of Pixel’s website that may now learn about and benefit from the IWBLabs project. 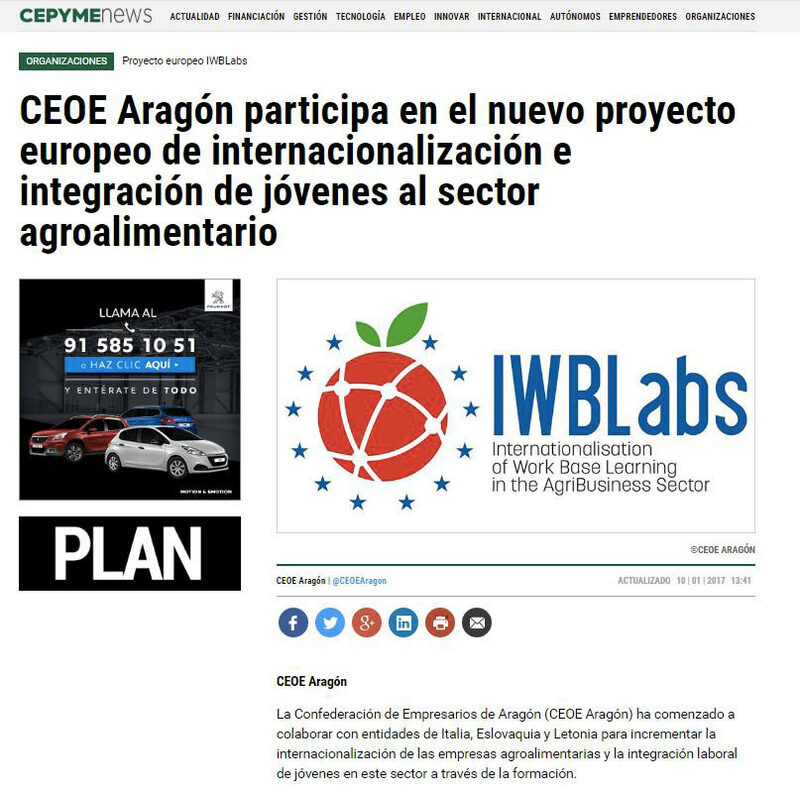 CEOE ARAGON is partner in the IWBLabs project. 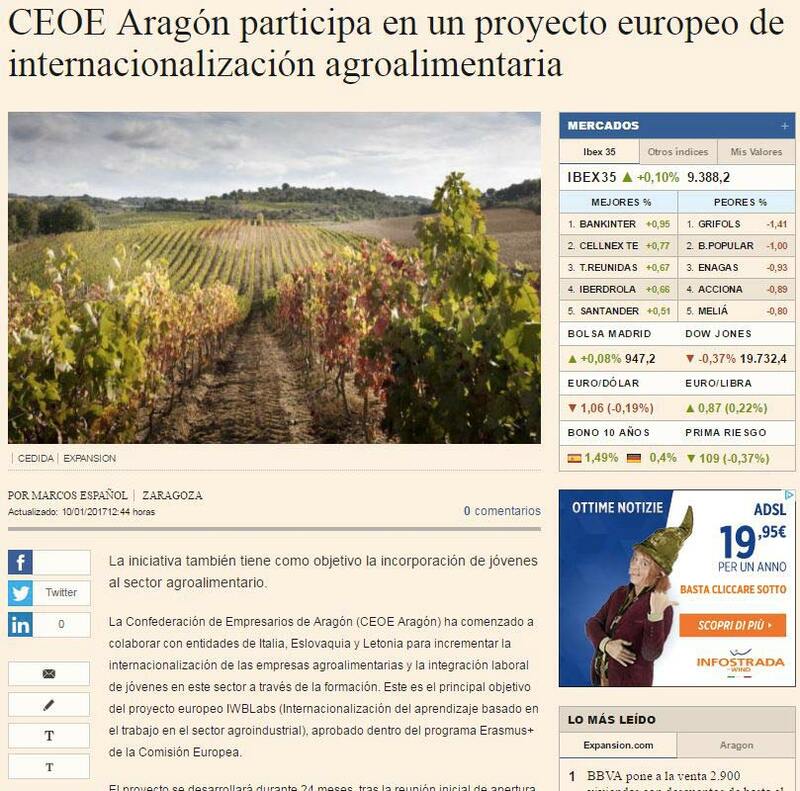 CEOE ARAGON website provides information about the project together with a direct link to the Portal. 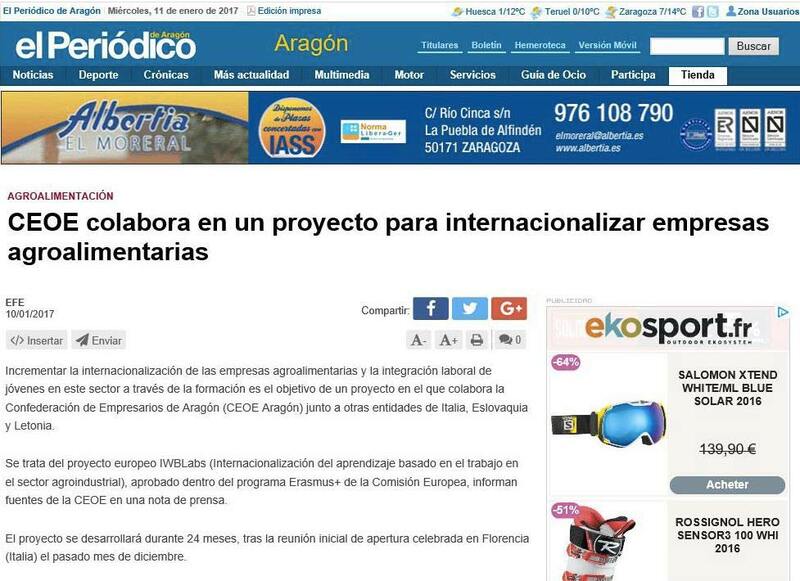 Exportar en Aragon is a public web site organised by Regional Government to promote internationalisation activities among more than 5.000 Smes. The web site provides information about the project together with a direct link to the Portal. 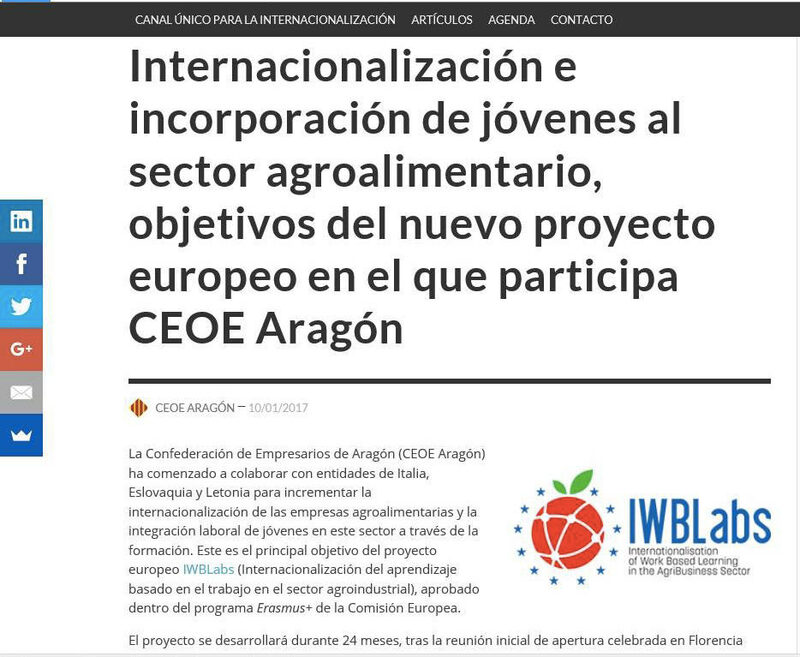 Aragon Digital is a press agency with significant impact in the regional audience which published an article about the IWBLabs project. Expansion is leading Spanish financial newspaper which published an article about the IWBLabs project. CEPYME NEWS is a web site for SMEs containing information about, legislation, projects, taxation which published an article about the IWBLabs project. 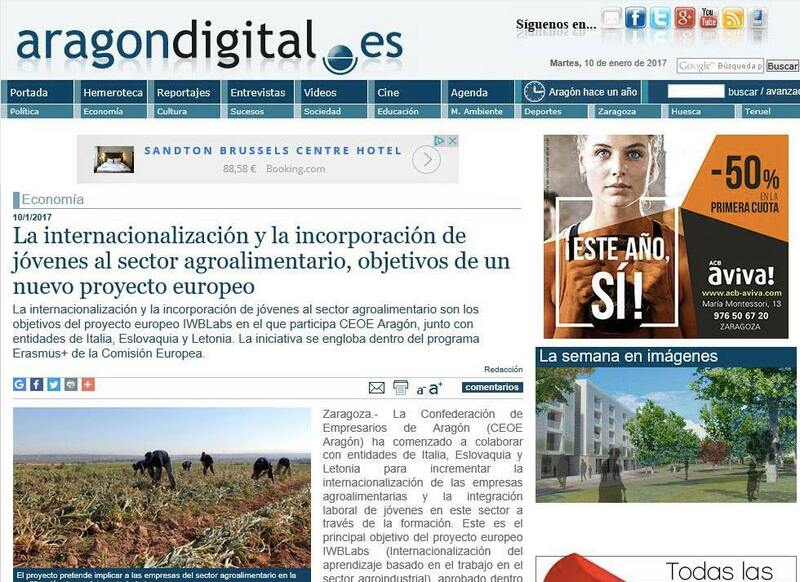 El Economista is a online financial newspaper which published an article about the IWBLabs project. El Periódico de Aragón is a regional newspaper. 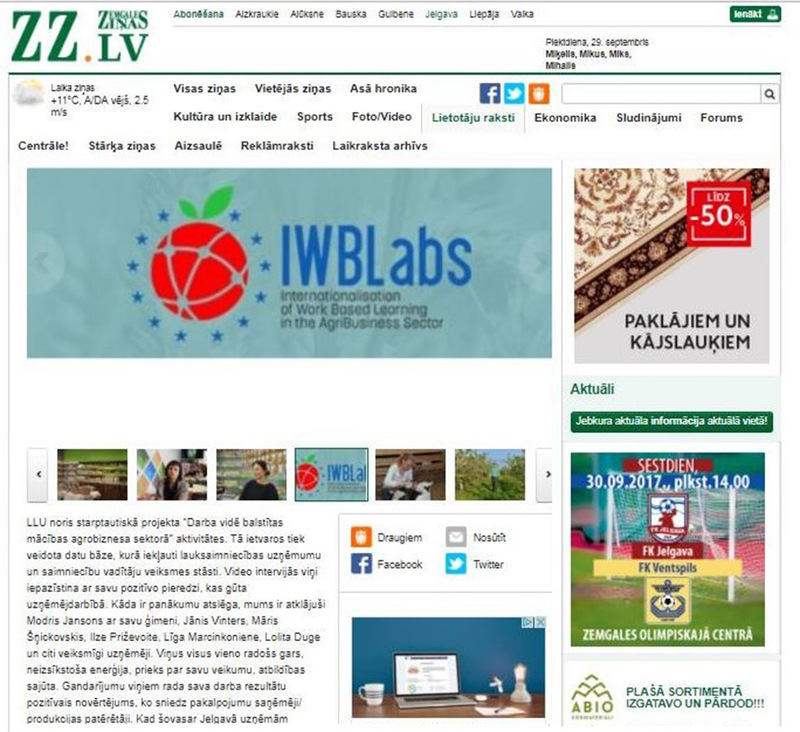 The audience is 50.000 readers daily which published an article about the IWBLabs project. 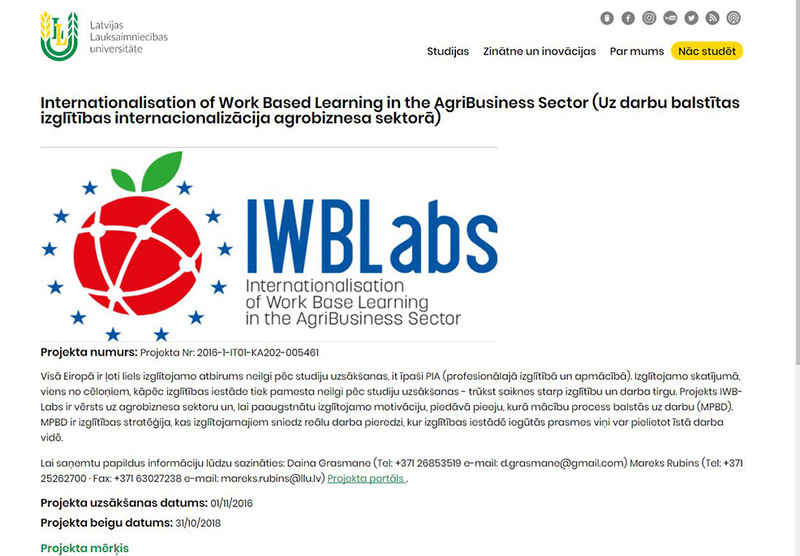 Alidoro is partner in the IWBLabs project. Pixel website provides information about the project together with a direct link to the Portal. 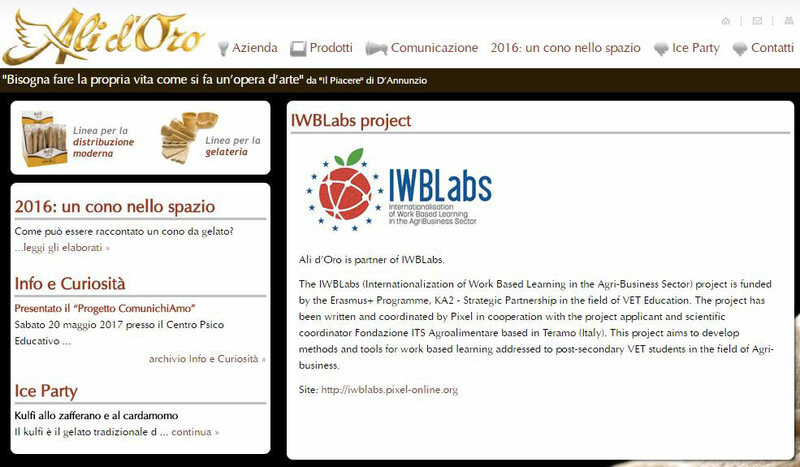 Collegio Provinciale Agrotecnici e Agrotecnici Laureati di Teramo is partner in the IWBLabs project. 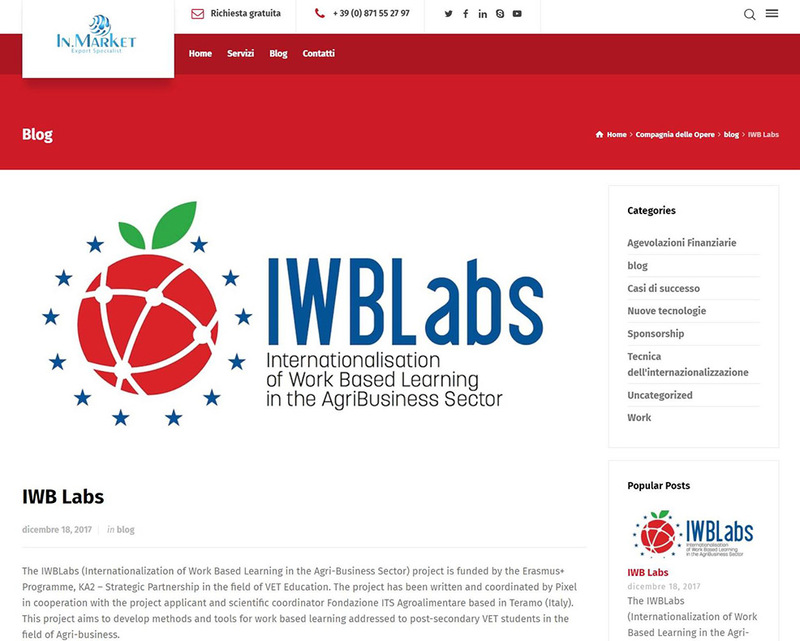 Collegio Provinciale Agrotecnici e Agrotecnici Laureati di Teramo website provides a direct link to the Portal IWBLabs project. Cykel is partner in the IWBLabs project. 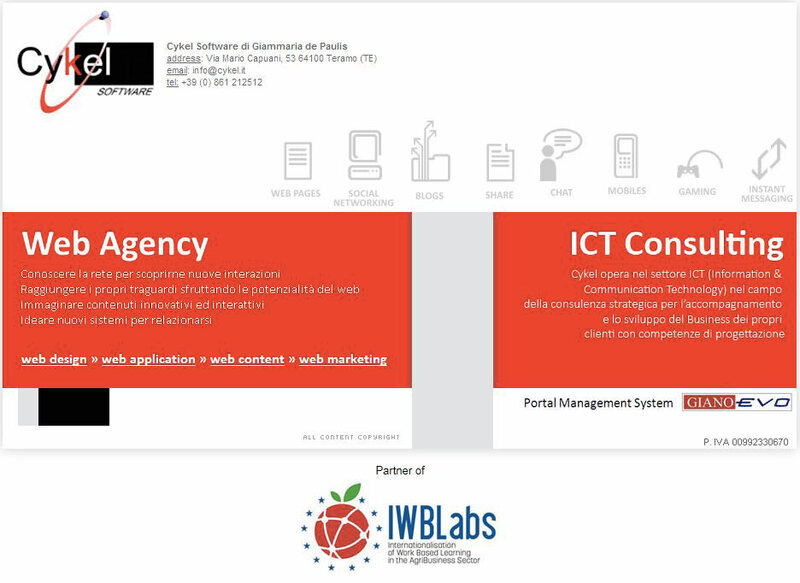 Cykel website provides a direct link to the Portal IWBLabs project. 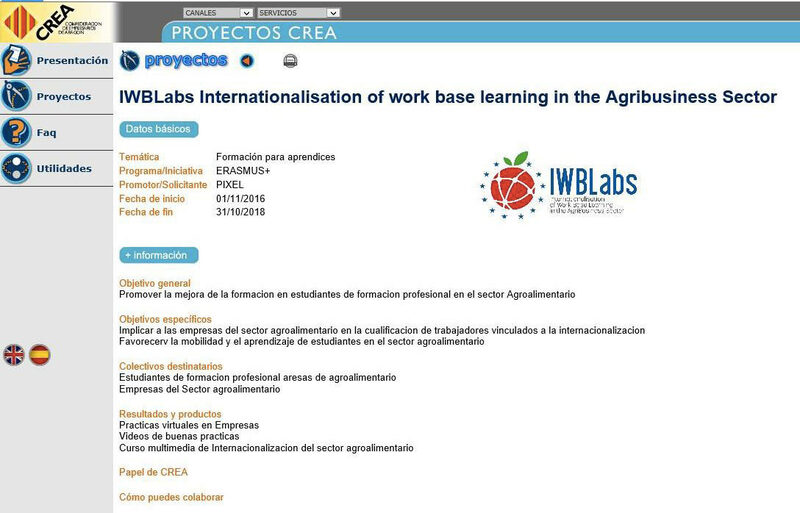 LLU is partner in the IWBLabs project. 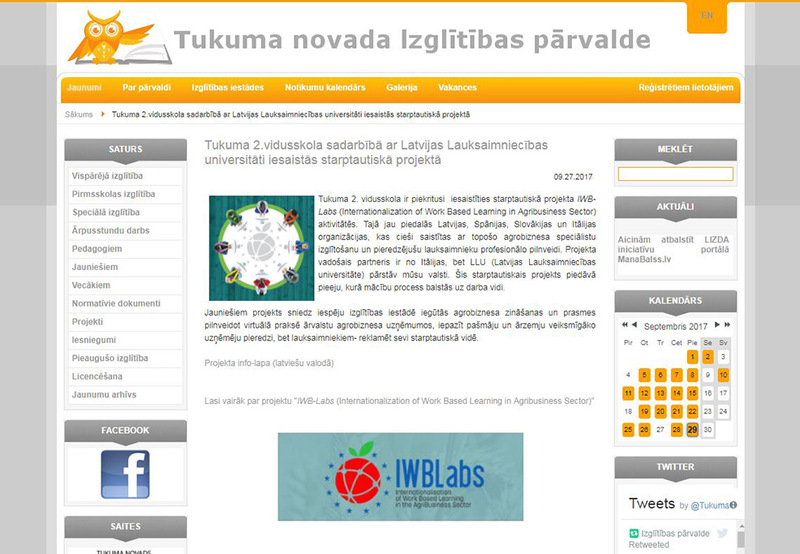 LLU website provides information about the project together with a direct link to the Portal. Lifelong Education centre is VET school which provides link with information about IWBLabs project. Language centre is VET school which provides information about about IWBLabs project as well as link with information about IWBLabs project. 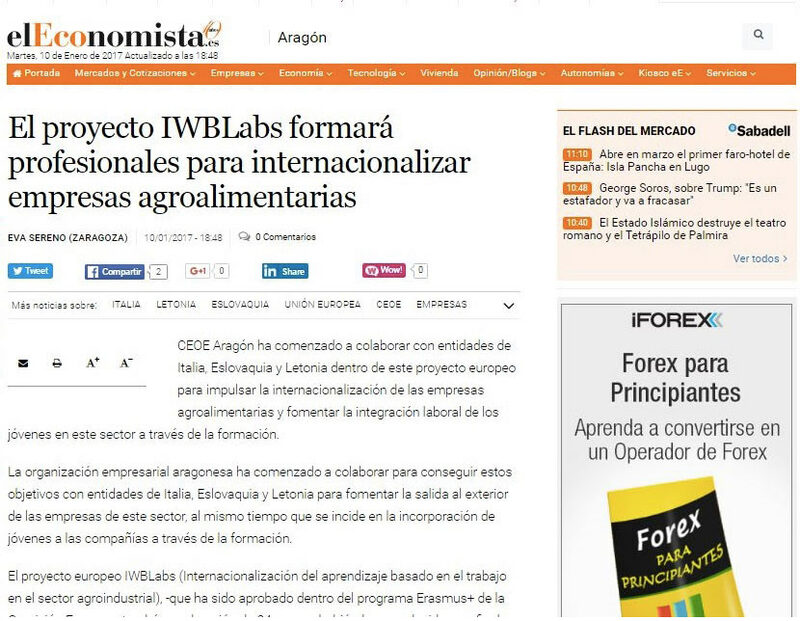 Agency for the Support of Regional Development is partner in the IWBLabs project. 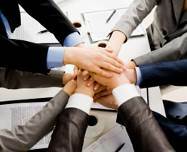 Its website provides information about the project together with a direct link to the Portal. Main clients of the agency and website – local municipalities, small companies, people for regional government. They may now learn about and benefit from the IWBLabs project. Medzi riekami is NGO which was established by local municipalities, local NGOs and private companies to work together for development of region (25 villages). They will lead process of Strategy for community lead local development implementation. Web page is visited by all members and inhabitants of involved area, including local schools. 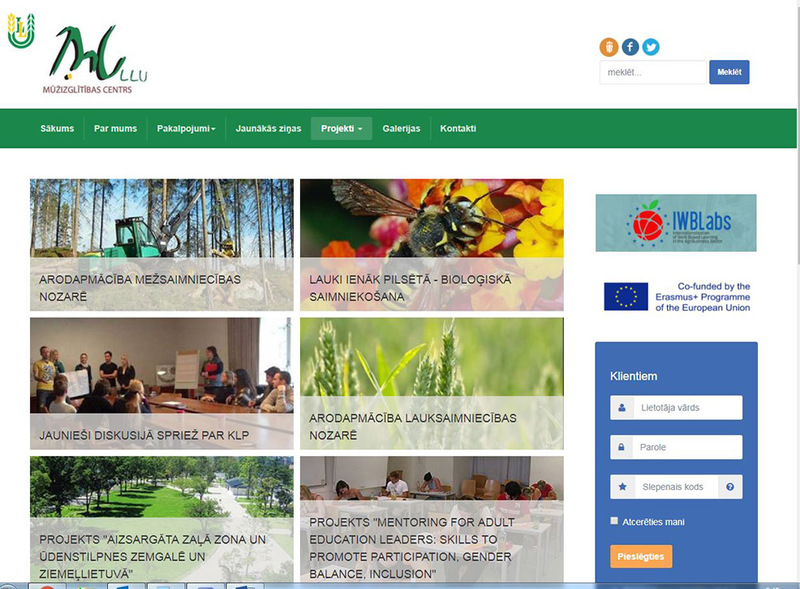 Department of Education for the Tukums Municipality website provides information about the project and direct link to the project webpage. Zemgales ziņas is a newspaper with significant impact in the regional audience. 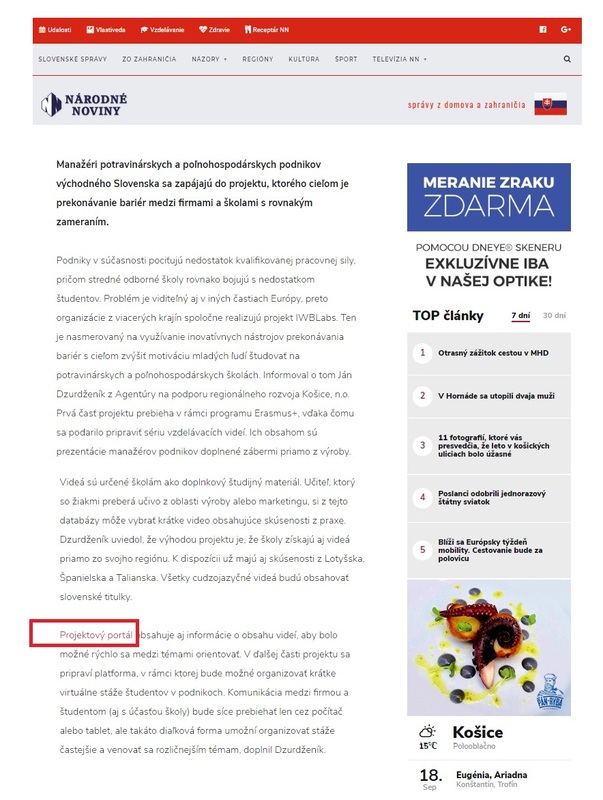 News website of Zemgales Ziņas published an article about the IWBLabs project. 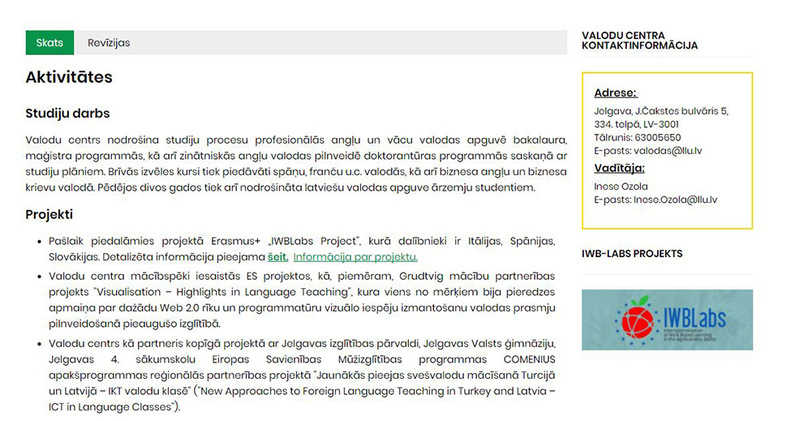 Secondary School No.2 of Tukums is a VET provider that takes part in the IWBLabs project activities. Website provides information about the project. 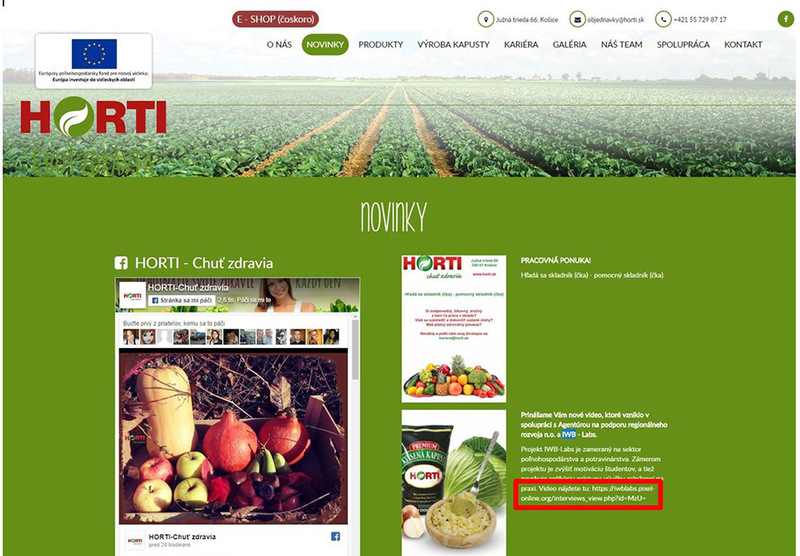 Horti is company producing sauerkraut. 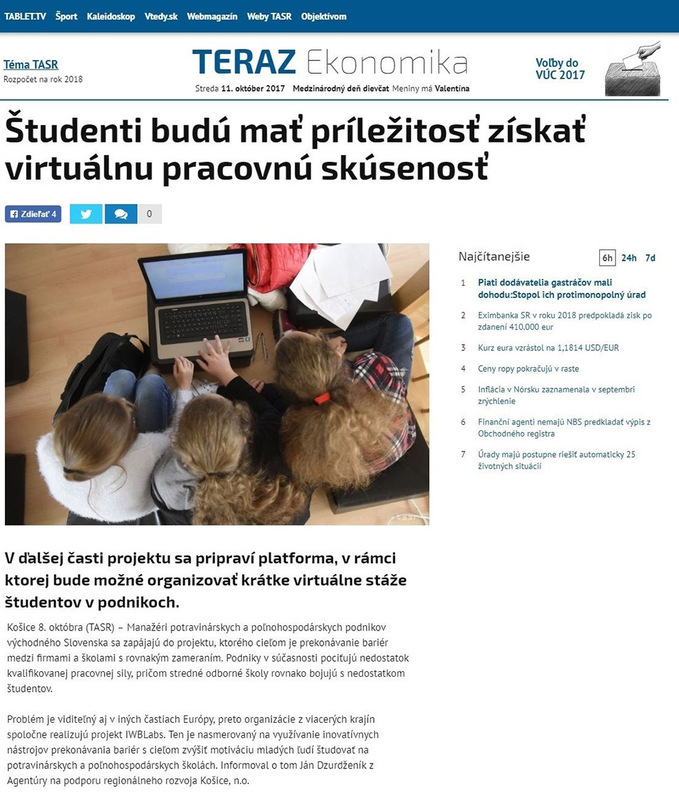 On their web site it is reported their involvement in the production of e-learning video lessons and interview. In:market is partner in the IWBLabs project. Pixel website provides information about the project together with a direct link to the Portal. 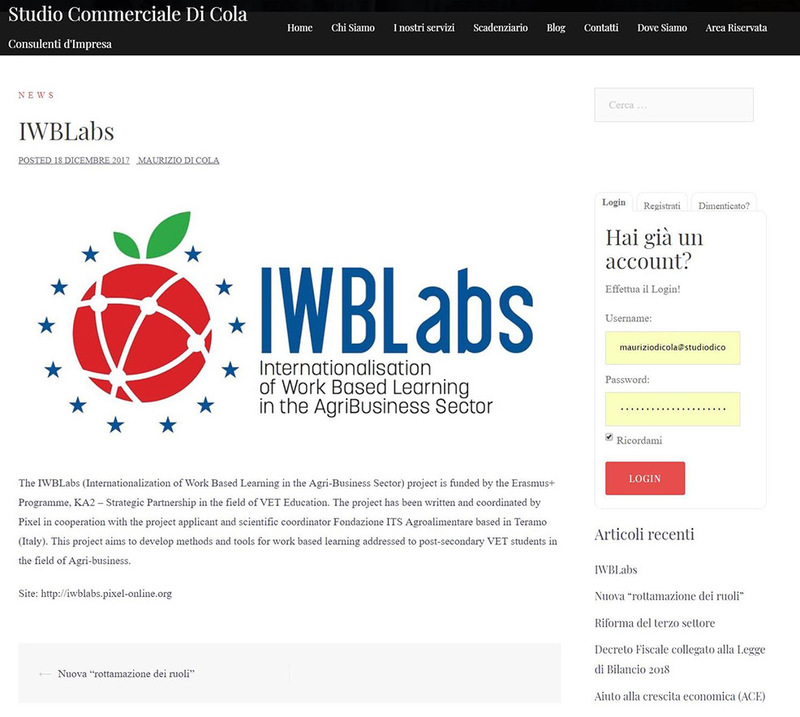 Studio Di Cola is partner in the IWBLabs project. Pixel website provides information about the project together with a direct link to the Portal. 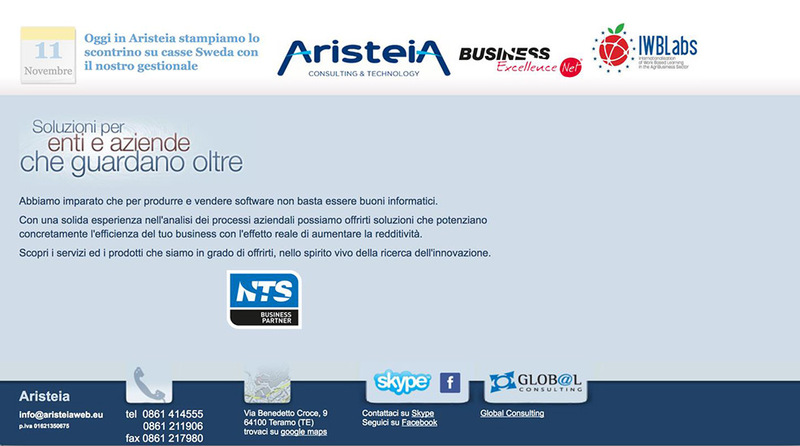 Aristeia is a full-service IT provider. We are specialized in business management software solutions, IT consulting, managed services, hardware and software products for SMEs. 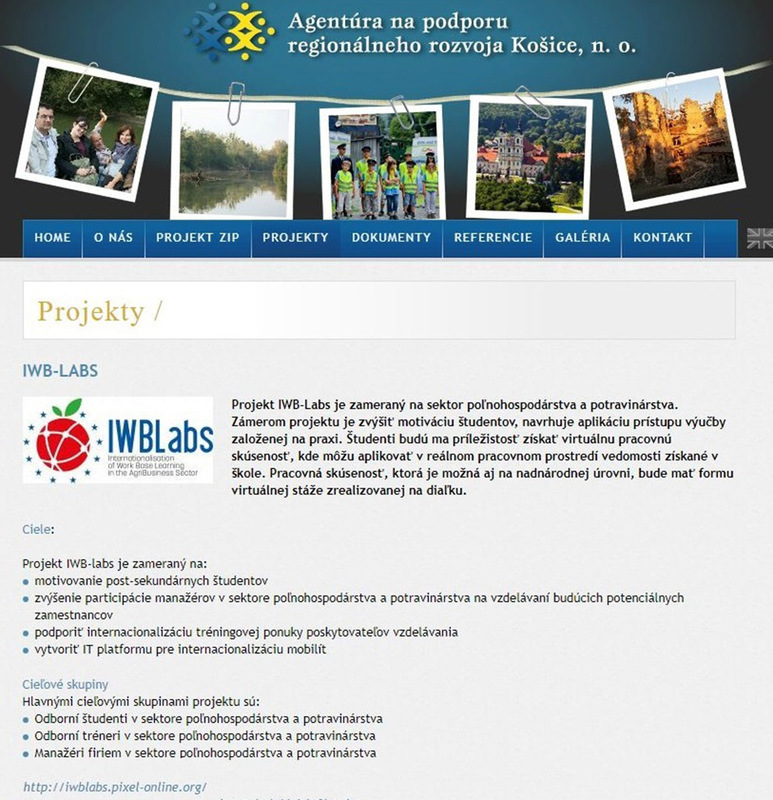 Aristeia website provides a direct link to the IWBLabs project Portal. Confindustria Teramo is an association involved in the project by the partner Agire. The website Confindustria teramo has a direct link to the IWBLabs portal. 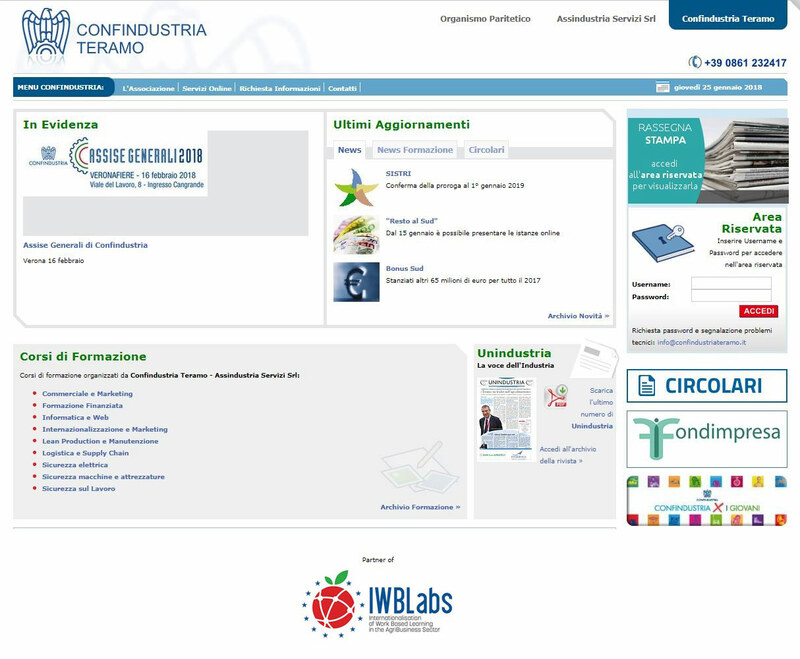 There are many users of the Confindustria website that can now get to know and take advantage of the IWBLabs Project. Consorzio Colline teramane is involved in the IWBLabs project as a trade association. Consorzio Colline teramane website provides information on the project along with a direct link to the portal. 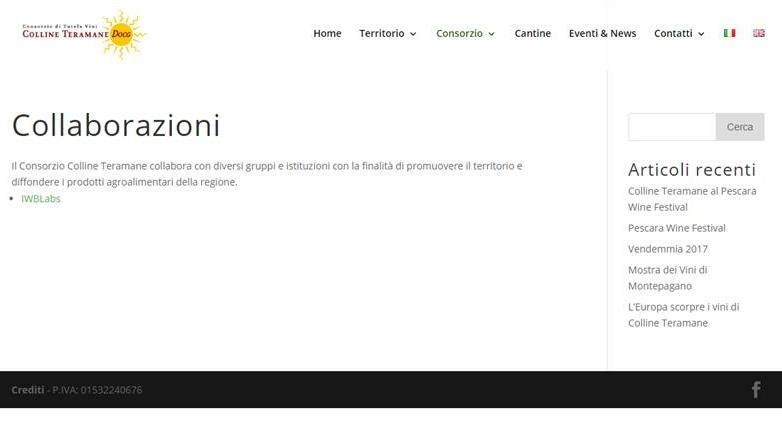 There are many users of the Consorzio Colline teramane website that can now get to know and take advantage of the IWBLabs project.